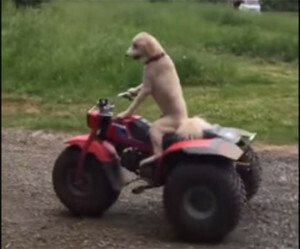 Video: Goldendoodle Drives A Three-Wheeler! It looks like more and more dogs are leaning how to drive these days and while they may not be street legal yet, dogs like Roscoe the goldendoodle are getting lots of practice in. Here, Roscoe is showing us how he drives a three wheeler on a farm. Roscoe is so proud of himself because for the first time he’s riding the three-wheeler unassisted. Don’t fret, his human are there to guide him and jump in if he needs help, but everything we see here is all Roscoe riding around at Lancaster Land, he’s even steering! At this rate, we’ll see dogs driving cars before we know it but still, this is one of those “see it to believe it” kind of things. Continue Reading And See The Video Of Roscoe Driving A Three-Wheeler Here! Guilty Labrador Gets Herself Tangled In Garden Hose! Tiny Beagle Puppy Goes Exploring!